Unfortunately, much of today’s views were obscured by haze and smoke being blown in from surrounding areas. 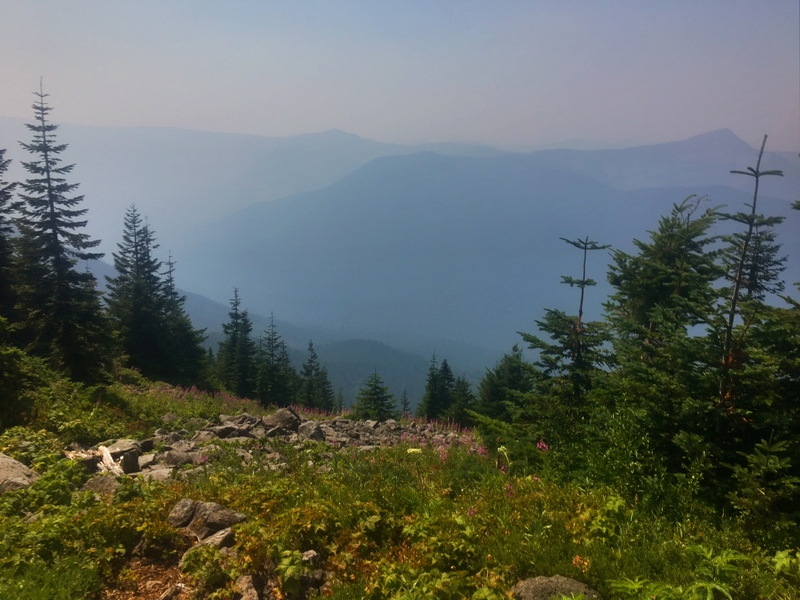 It was supposed to be 105 degrees in the nearby town of Cascade Locks (4000′ lower), so I as feeling lucky that the temps were as comfortable as they were…helped by elevation, the thick forest canopy and even that layer of haze. This is Ramona Falls. The vegetation has definitely made changes recently. 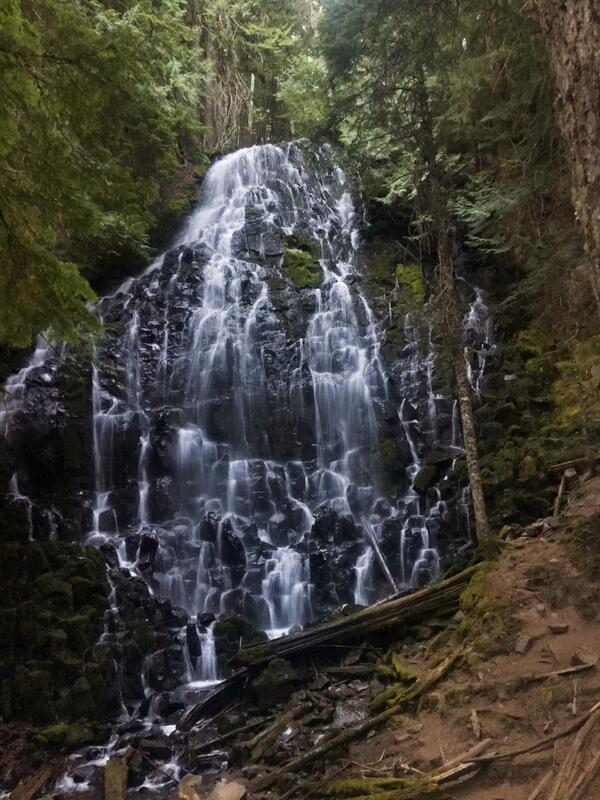 There have been ferns and cedar trees and an overall feeling of a greener understory. There was an early morning log crossing over some swift moving water. 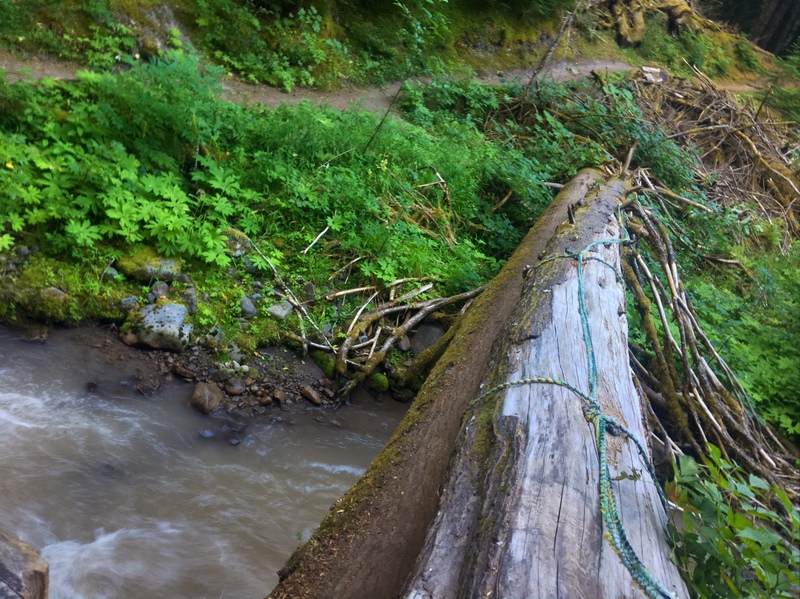 It had an old decaying rope lashed onto the upper log which actually provided a little psychological assistance as the lower log got fairly narrow by the end. 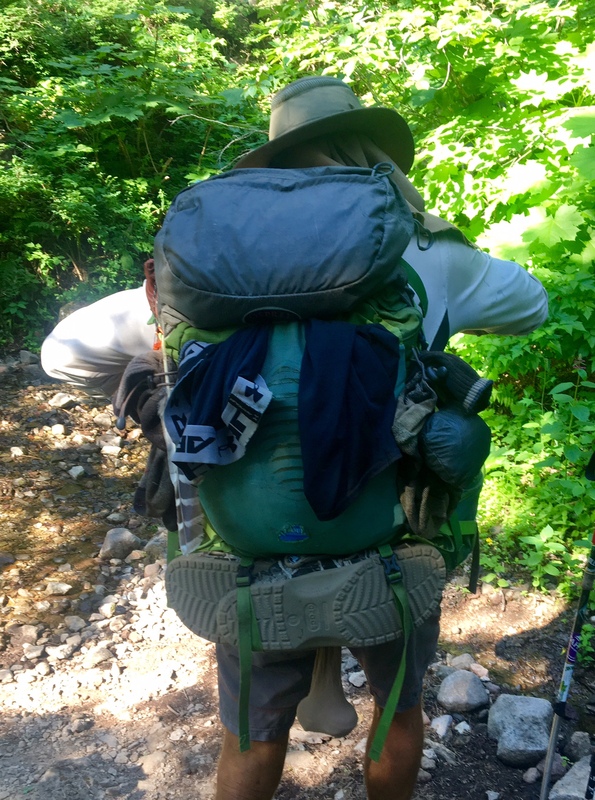 Breeze thinks he’s onto to the next big thing in backpack accessories…”Trail Nuts”. I think it just looks like he blew out his shorts and has some sort of weird condition. Normally, this would have been a spectacular view of Mt. Hood but today it is mostly obscured by haze. 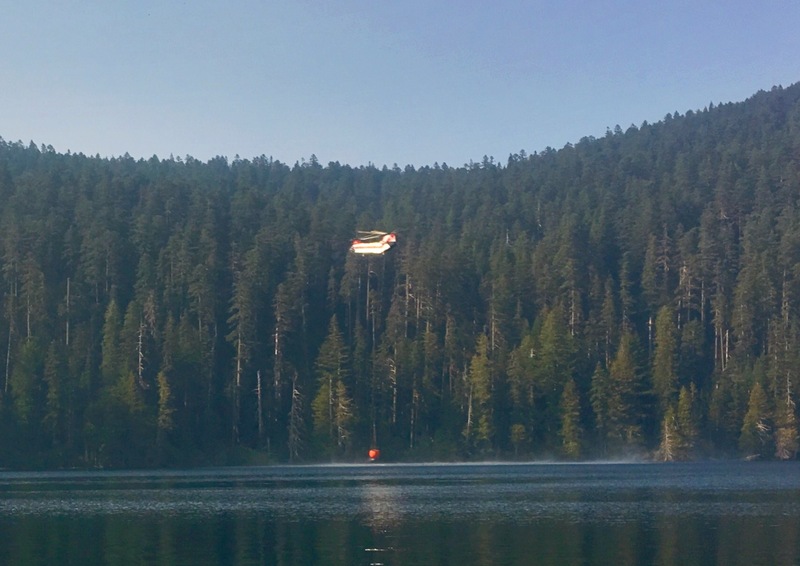 There was a double rotor helicopter making laps with a water bucket in an effort to put out an ongoing persistent fire nearby. 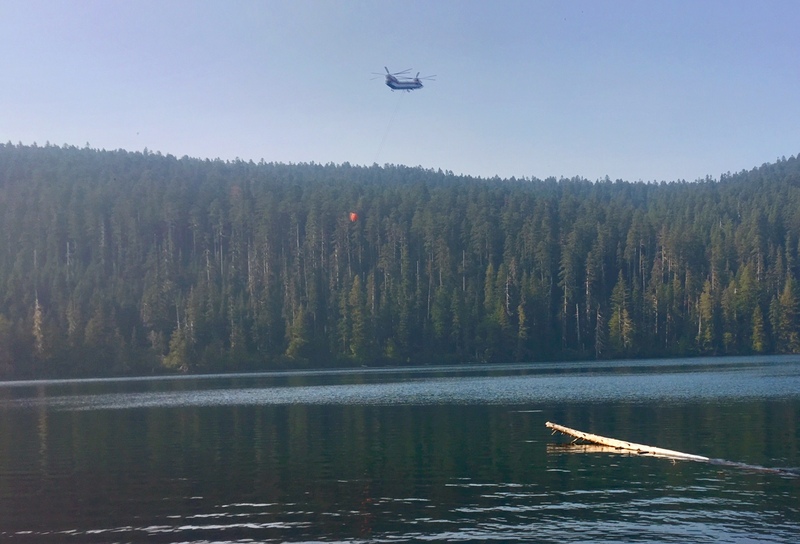 Unfortunately, this fire prevented us from hiking a common alternate route through Eagle Creek and the famous Tunnel Falls. Scooping water out of the lake. This brief section of trail gave me traumatic AT flashbacks from the White Mountains. 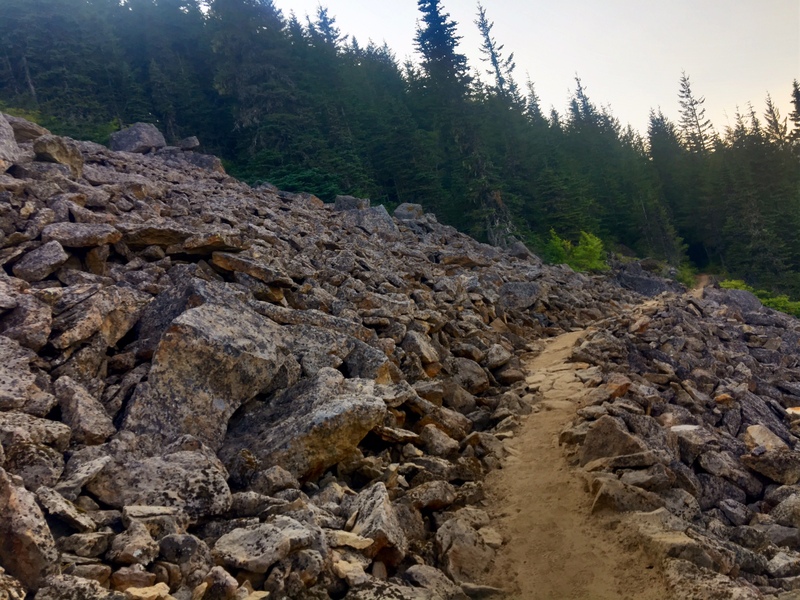 The PCT was kind enough to build an actual footpath through the giant rubble rather than making us scramble. I’m camped with Monster for the the 5th night in a row. Tomorrow he’s going to visit some friends in Portland for a couple days. It is definitely one of the warmer nights I’ve had…In using my sleeping bag in “quilt” mode for the first time. 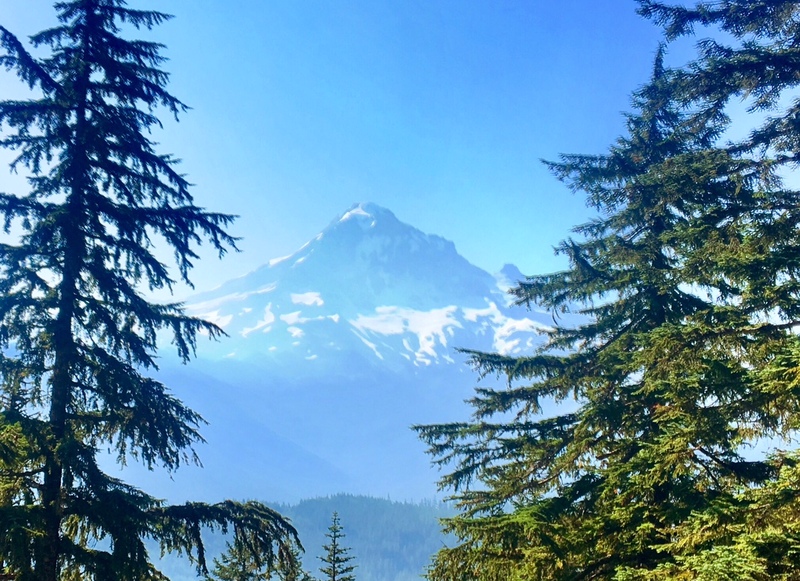 This entry was posted in 2017 Pacific Crest Trail, Uncategorized. Bookmark the permalink.